Sofia Mitsola discusses her unique approach to painting the female body with curator, writer and former Director of Camden Arts centre Jenni Lomax. The conversation will be followed by an opportunity to ask questions. The galleries and cafe will be open between 5-7pm, guests are welcome to view Jerwood Solo Presentations and get refreshments ahead of the talk at 7pm. Sofia Mitsola works in painting, drawing and print to explore representations of the female body. For Jerwood Solo Presentations 2019 she showcases a new series of paintings of individual and grouped female subjects. These incorporate motifs associated with Greek and Egyptian mythology, resulting in works that elude danger, strength, fragility and innocence. Coldstream Prize from the Slade School of Fine Art, the British Institution Award for Studentsfrom the Royal Academy of Arts for her participation in the 250th Summer Exhibition, and the Tiffany & Co x Outset Studiomakers Prize. 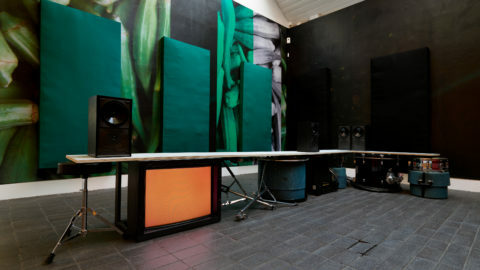 Working in the fields of visual art and art education, Jenni Lomax was the Director of Camden Arts Centre, London, from 1990 to 2017, where she established an influential and forward-thinking programme of international exhibitions, artists, residencies and education projects, all of which have artists and their ideas at the core. She led the organisation through a major building refurbishment scheme which was completed in early 2004. Before Camden Arts Centre, Jenni developed and headed up the Community Education and Public Programmes at the Whitechapel Art Gallery for 10 years through the 1980’s. Throughout her career she has been closely involved in projects that champion and support artists and art education at all levels and has been a member of selection and judging panels for numerous artists’ awards and exhibitions including: The Freelands Award, The Turner Prize, Arts Foundation Award, Jerwood Drawing Prize, Nissan Art Prize, Outset Studio Makers, Award and the John Moores Painting Prize. She is currently working independently on a range of curatorial, writing and archival projects. In addition, she regularly gives talks and takes part in seminars and panel discussions in art and educational institutions across Britain and abroad whilst also working in an advisory capacity to a number of charitable organisations and grant giving foundations.